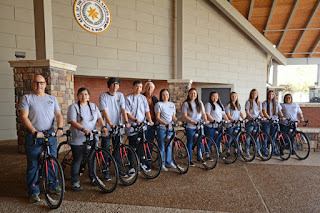 Mentor rider Kevin Stretch, Shadow Hardbarger, Josh Chavez, Steven Shade, Cherokee Nation Principal Chief Bill John Baker, Kayli Gonzales, Ashley Hunnicutt, Elizabeth Hummingbird, Sydnie Pierce, Brooke Bailey, Destiny Matthews and mentor rider Marie Eubanks. The nine cyclists, ages 20 to 24, started training in December. The tribe also selected two Cherokee Nation citizens to be mentor riders: 55-year-old Marie Eubanks, a teaching assistant at the Cherokee Immersion School, and 58-year-old Kevin Stretch, interim director of Cherokee Nation Community and Cultural Outreach. Roland voters will go to the polls Tuesday, March 5 to vote on two bond propositions that would equal a 8.26% school property tax increase. The tax would be used to pay for a $9 million multi-purpose community event center that would also serve the community as a storm safe shelter. A portion of the funds will also go for repairs to existing facilities. According to an information sheet provided by Roland Superintendent Randy Wood, the goal is to "pass a bond to insure that our students will not only be housed and transported in safe and secure environments, but are also able to showcase their talents in an event center that aids and assists our community as well through its many possible uses." The bond would also allow for roof repairs on existing buildings, the addition of aluminum bleachers at the football stadium, a softball dressing facility and the purchase of two passenger vans. A second bond proposition on the ballot would allow for the purchase of two new school buses with cameras. The value of the second bond is $160,000. The impact of the bonds would be an increase of $0.69 per month for every $100 in property taxes that are paid. Roland's current millage is 13.1 and would increase to 20.01 with the passage of the bond which would still be lower than many of the surrounding towns. If the bonds are passed the monies will be available beginning this summer. An early morning shooting at an apartment complex in Fayetteville ended with the suspect being located and arrested in Moffett. The suspect, Lee Massey, 29, had fled the scene when authorities arrived. A Sequoyah County deputy, who also serves as a school resource officer at Moffett School, recognized Massey from the photo provided with the BOLO and alerted authorities to a possible location that Massey might be found. Officers arrived at the residence and arrested Massey for first degree battery. A representative with the Fayetteville police dept. 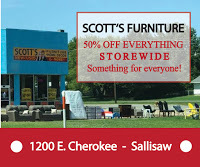 noted that they had worked closely with the Sequoyah County Sheriff's Dept, Moffett Police Dept. and Sallisaw Police Dept. The Oklahoma Medical Marijuana Authority (OMMA) has closed down one area of the agency in order to process a backlog of thousands of applications they have received involving medical marijuana. The authority closed its call center, which was reportedly answering more than 1,000 calls per week, in order to allow authority members to concentrate on processing applications. In the past six months Oklahoma has licensed over 65,000 cardholders. According to the OMMA they currently receive approximately 5,000 applications per week. The OMMA's policy is that they will respond to applications and requests within 14 calendar days. Because of the increasingly heavy volume they were forced to shuffle employees around to process the requests. Officials have stated that they are in the process of hiring and training more staff. The closure of the call center is temporary but there is currently no indication of when it will be reopened. According to the Oklahoma Tax Commission medical marijuana sales reached over $4.3 million in January and generated $305,265 in taxes during the same period. Numbers from the OMMA state that as of February 25th, 65,752 patients, 456 caregivers and 3,718 business applications have been received for a total of 69, 926. 54,253 patient, 331 caregiver, 1,041 dispensary, 1,836 grower and 508 processor licenses have been approved for a total of 57, 969. * Vian Community Blood Drive; Friday, March 1, 1 to 6 p.m. at Marvin’s IGA. 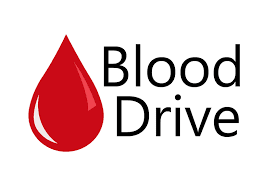 * Wal Mart Sallisaw; Friday, March 1, 1:30 to 5:30 p.m.
Only ten percent of people in the United States who are eligible to give blood actually do. Whole blood can be donated every 56 days. Platelet donations can be made as often as every 7 days, up to 24 times a year. Those with negative blood types are especially urged to give. If donors opt not to take the t-shirt, Oklahoma Blood Institute will make a monetary donation to Global Blood Fund for blood center assistance in developing countries. As a non-profit blood center, Oklahoma Blood Institute’s generous donors provide every drop of blood needed for patients in more than 160 hospitals statewide. Appointments are not required but can be made by calling Greg at 479-652-2362 or visiting obi.org. Pictured from Left to Right: Amber Wright, Judy Martens, Carla Fivekiller and Ronnie Bishop take an oath promising to advocate for the best interests of abused and neglected children. CASA for Children is proud to announce 4 new CASA volunteers have been sworn in to advocate for children that have been abused and neglected in Sequoyah County. 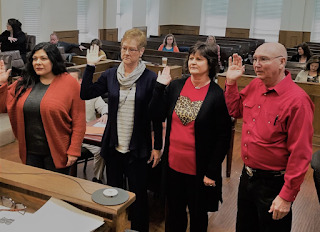 CASA staff and volunteers gathered at the Sequoyah County Courthouse on February 12, 2019, to witness Amber Wright, Judy Martens, Carla Fivekiller and Ronnie Bishop take an oath promising to advocate for the best interests of children placed in the custody of the State of Oklahoma. The newly appointed CASA volunteers join 14 other dedicated community members who have been specially trained and are advocating for foster children in the county’s juvenile dependency court system. As officers of the court, they ensure that the children’s needs are recognized and that their best interests are considered both in the courtroom and in the community. CASA volunteers are a powerful voice for a child in need. Volunteers work directly with children and families to ensure the children’s needs are met for long-term safety and success. Volunteers act as direct advocates for abused and neglected children, ensuring they don’t slip through the cracks of the child welfare system. CASA volunteers complete 30 hours of classroom training prior to being sworn in and assigned to a case. Volunteers must pass an extensive background screening, be 21 years of age or older, and have a heart for children. CASA is in need of more great advocates like these men and women. Classes are forming now for the Spring advocate training to begin in April 2019. If you are interested in learning more about becoming a CASA volunteer and the rewards that come along with serving as the voice of a child, please contact Jenny Crosby at 918-686-8199 or via email at jenny@casaok.org. You can make a difference in the life of a child. Be their voice. Be their CASA. On Tuesday a bill designed to stop the relocation of a state veterans center from Talihina to Sallisaw passed through an Oklahoma House of Representatives committee by a vote of 6-2. The bill, proposed by State Rep. Jim Grego of Latimer County, is now eligible to be heard by the entire House of Representatives. 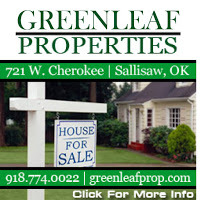 The intent of House Bill 1149 is to repeal legislation that would close the Talihina facility and allow for transfer of the center to Sallisaw. It was announced last fall that the Oklahoma Veterans Commission and the Oklahoma Department of Veterans Affairs would move the 175-bed, long-term veterans care center from the aging Talihina facility to a new $100 million center in Sallisaw within the next three to five years. “There is no reason the Oklahoma Department of Veterans Affairs can’t update this existing facility to better accommodate the needs of its residents,” Grego had stated previously. The Talihina facility was built in 1921 and has been found to be in much need of repair and updating. Rep. Chris Kannady, R-Oklahoma City, who originally authored the bill to relocate the facility to Sallisaw has changed his stance and today voted in favor of passing the new bill out of committee. Kannady is a native of the Talihina area and was quoted as having said that he changed his position on the facility's transfer due to a "change of leadership" in the Talihina area. Elected officials have noted that all indications are that even though the bill has made it out of committee it will be dead on arrival when it reaches the house floor. Voters will go to the polls Tuesday for the March 5th Special Roland/Vian School Proposition Election, Sequoyah County Election Board Secretary Cindy Osborn said today. - Physically disabled voters who cannot enter the polling place, need help marking their ballots, blind or visually disabled voters and illiterate voters may be assisted by a person the voter chooses. In all cases, a person providing such assistance may not be the voter’s employer or an agent of the employer or an officer or agent of the voter’s union. A person providing assistance also must swear or affirm that the voter’s ballots will be marked in accordance with the voter’s wishes. Alternatively, all blind, visually impaired, and physically disabled voters is Sequoyah County may use the audio-tactile interface (ATI), a feature offered on all Oklahoma voting devices, to vote privately and independently, either at Sequoyah County Election Board during early voting or at their assigned polling place on Election Day. 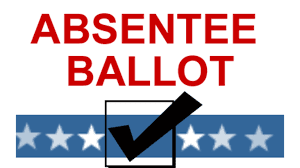 Those who might qualify for an emergency absentee ballot should contact the County Election Board office at 981-775-2614 as soon as possible for more information. The U.S. Attorney’s Office for the Eastern District of Oklahoma announced that Donald Lee Blackbird, age 59, of Vian, Oklahoma was sentenced to 60 months’ imprisonment, and 5 years of supervised release for Attempted Sexual Abuse Of A Minor. 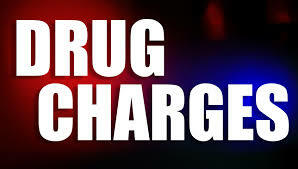 The charges arose from an investigation by the Cherokee Nation Marshal Service, and the Federal Bureau of Investigation. The Indictment alleged that on or about April 3, 2018, in the Eastern District of Oklahoma, in Indian Country on an allotment, the title to which had not yet been extinguished, the defendant, an Indian, knowingly attempted to engage in a sexual act with a person who had attained the age of 12 years, but had not attained the age of 16 years and was at least four years younger than defendant. Ronald A. White, U.S. District Judge, presided over the hearing. Assistant U.S. Attorney Kristin Harrington represented the United States. 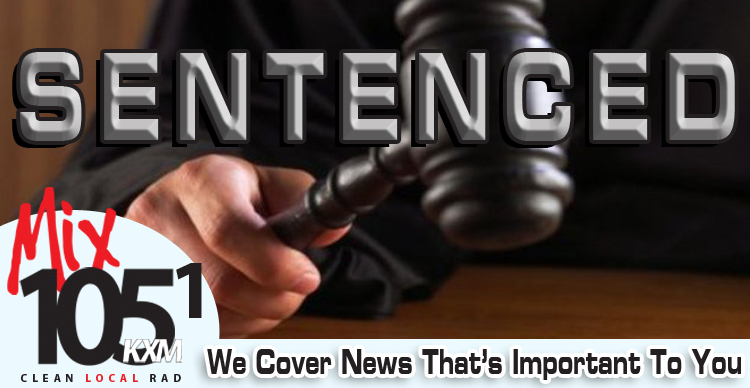 The defendant will remain in custody pending transportation to the designated federal facility at which the non-paroleable sentence will be served. The 54th Sequoyah County Junior Livestock Show will be held Feb. 27 through March 1 at the Sequoyah County Fairgrounds in Sallisaw. The livestock show is sponsored by the many members of the Sallisaw Chamber of Commerce, and features a Bidders Barbecue at 6 p.m. on Friday (March 1), followed by the premium auction at 7 pm. Friday. The show begins on Wednesday (Feb. 27). Wednesday’s schedule includes goats, lambs, heifers and steers, along with goat, sheep and beef showmanship. Animals will be checked in between 9 a.m. and noon, and showing begins at 5 p.m.
Swine will be shown on Thursday (Feb.28), and check-in is again between 9 a.m. and noon. Showing begins at 5 p.m. and includes swine showmanship. A concession stand, with an expanded menu, will be available with profits going to the Sequoyah County 4-H Club. Roger Stites, Sallisaw High School Vo-Ag instructor, has served as chairman of the livestock show committee for three years. Sinclair Armstrong of Vian is again in charge of the Bidders Barbecue, which is open to everyone. Auctioneer Tommy Wright will be the auctioneer for the premium auction. For more information contact the OSU Extension Office in the Sequoyah County Courthouse in Sallisaw or call 918-775-2368. 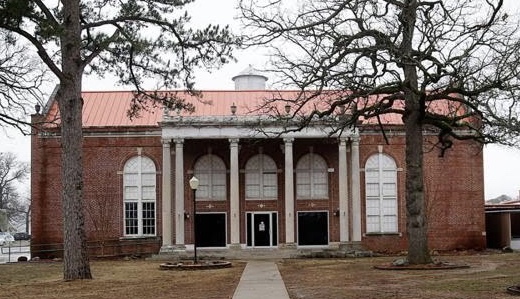 Less than a week remains for registered voters in Sequoyah County to apply for absentee ballots to be mailed to them for the March 5th Special Roland/Vian School Proposition, County Election Board Secretary Cindy Osborn said today. 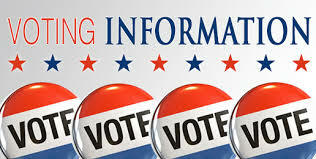 Applications for absentee ballots must be received by the County Election Board no later than 5 p.m. Wednesday, February 27th, to be processed in time for the election. Military personnel, residents of Sequoyah County living overseas, and the spouses and dependents of each group may apply only by mail, by fax, or by e-mail. For more information and instructions, military and overseas voters may visit the Federal Voting Assistance Program website: www.fvap.gov/oklahoma. 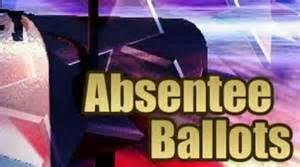 For more information on absentee voting, contact the County Election Board at 110 E Creek St Sallisaw Ok 74955. 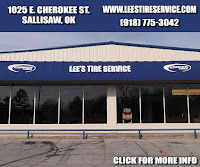 The telephone number is 918-775-2614. The County Election Board’s fax number is 918-775-1205. 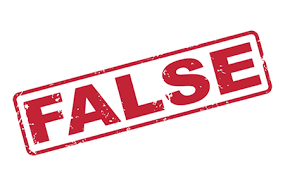 A recent post on social media stating that there have been three attempted child abductions at Walmart in Sallisaw is false according to Sallisaw Police Captain Jeff Murray. The Sallisaw Police Dept. began receiving calls after word of the social media post began to spread but have assured all callers that the there have been no known abduction attempts. The U.S. Attorney’s Office for the Eastern District of Oklahoma announced that Stoney Ray Mendenhall, age 19, of Stilwell, Oklahoma was sentenced to 34 months’ imprisonment, three years of supervised release, and ordered to pay restitution in the amount of $33,767.23, for Possessing, Receiving And Concealing A Stolen Firearm. The charges arose from an investigation by the Adair County Sherriff’s Office, and the Bureau of Alcohol, Tobacco, Firearms and Explosives (“ATF”). The Indictment alleged that on or about February 3, 2018, the defendant, Stoney Ray Mendenhall, knowingly possessed, received and concealed a stolen firearm which had been shipped and transported in interstate commerce. U.S. District Judge Ronald A. White presided over the hearing. Assistant U.S. Attorney Dean Burris represented the United States. The defendant will remain in custody pending transportation to the designated federal facility at which the non-paroleable sentence will be served. A Sallisaw woman was charged this week with a felony charge of unlawful possession of controlled drug with intent to distribute and misdemeanor charges of unlawful possession of drug paraphernalia, resisting an officer, failure to signal on turning and speeding. According to the report filed with the charges, Amber Elizabeth Cox, 41, of Sallisaw, was stopped by a Seqouoyah County Deputy for speeding and failing to signal on Feb. 8 in Muldrow. Cox exited her vehicle and was asked to provide her driver's license and insurance verification. The deputy was advised by dispatch that the license was valid but the insurance was expired and Cox had pending and previous drug cases on her record. The deputy asked Cox if she had anything illegal in her vehicle to which she responded that she did not. When asked if she would consent to a search of the vehicle Cox refused to answer yes or no and reportedly became increasingly nervous. A K9 officer was called to the scene and Cox was advised to step to the back of the vehicle to be patted down for weapons. After refusing to comply, Cox was advised she would be arrested if she continued to refuse. At this point Cox slammed some papers along with a small, white object on the hood of a nearby truck. The white object went over the hood and onto the ground. The deputy then placed Cox against her vehicle and she began trying to pull away until she was able to pull a folded bill from the front of her pants, drop it to the ground and kick it under the vehicle. Cox was handcuffed and placed in the deputy's unit. The white object was located and described as a "cut and melted straw which appeared to contain approximately a gram of a white crystal like substance suspected of being methamphetamine." The dropped bill was located and contained what also appeared to be methamphetamine. Cox denied that the items were hers. She was arrested for possession with intent to distribute methamphetamine due to the way the narcotics were packaged. Cox was booked into the Sequoyah County Jail and later released on a $5,000 bond. Her next court appearance is slated for Feb. 20 on Judge Waters disposition docket. The Sequoyah County Sheriff's Dept. 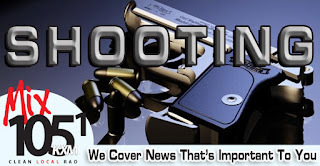 is investigating a shooting that occurred near Dora during an alleged domestic dispute on Valentine's Day at approximately 9 p.m. According to Sequoyah County Sheriff Larry Lane, a 66-year-old male was shot in the abdomen and was later transported to Mercy Hospital in Fort Smith. The victim underwent surgery Thursday night and again Friday morning. The shooting is still being investigated and it will be determined later what, if any, charges will be filed. The names of the suspect and victim have not been released at this time. Both individuals are residents of Sequoyah County. Voters in Sequoyah County who want to have absentee ballots mailed to them for the March 5th Special Roland/Vian School Proposition Election should apply now, County Election Board Secretary Cindy Osborn said today. Although the County Election Board can accept applications for absentee ballots until 5 p.m. on Wednesday, February 27th, Osborn urged voters who want to vote by absentee ballot to apply early. 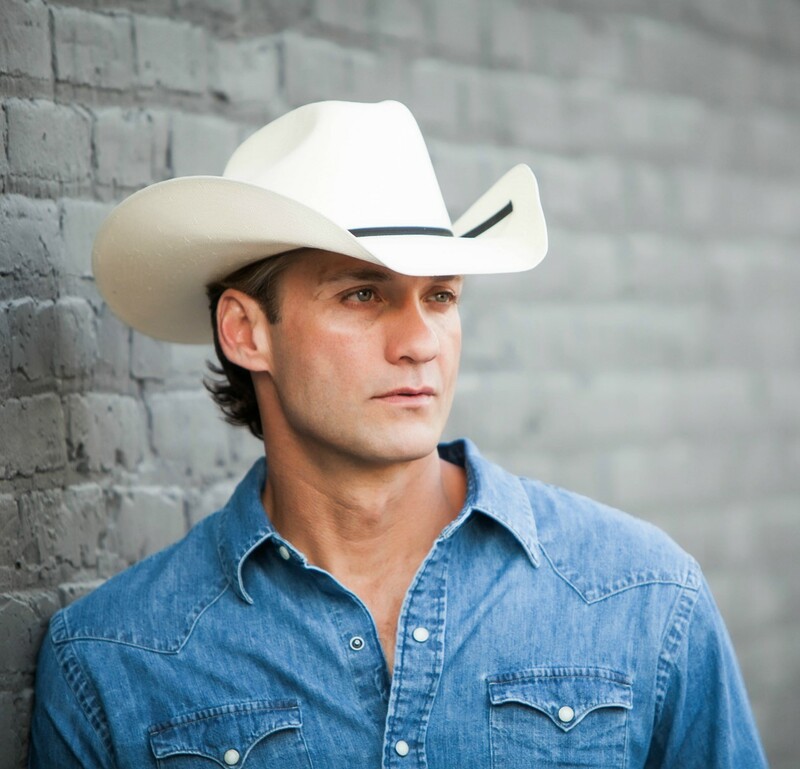 American country music artist Wade Hayes to perform a free show on March 1 on the Lee Creek Tavern stage, inside Cherokee Casino and Hotel Roland. Country music’s power has always been in its ability to reflect real life, and few artists have a stronger gift for capturing both heartache and hope than Wade Hayes. The singer-songwriter has navigated a recently complicated journey, all while producing some of the most potent songs in his already impressive career. On March 1, Hayes hits the Lee Creek Tavern stage inside Cherokee Casino and Hotel Roland for a free show. Hayes has since released his 2015 album, “Go Live Your Life,” featuring upbeat anthems that became part of his healing. His newest piece of art, “Old Country Song,” was released in June. For more information on Hayes, visit www.wadehayes.com.